CHEMICAL CONSTITUENTS OF GARLICGarlic contains 0.1-0.36% of a volatile oil these volatile compounds are generally considered to be responsible for most of the pharmacological properties of garlic. Garlic contains at least 33 sulfur compounds like aliin, allicin, ajoene, allylpropl, diallyl, trisulfide, sallylcysteine, vinyldithiines, S-allylmercaptocystein, and others. 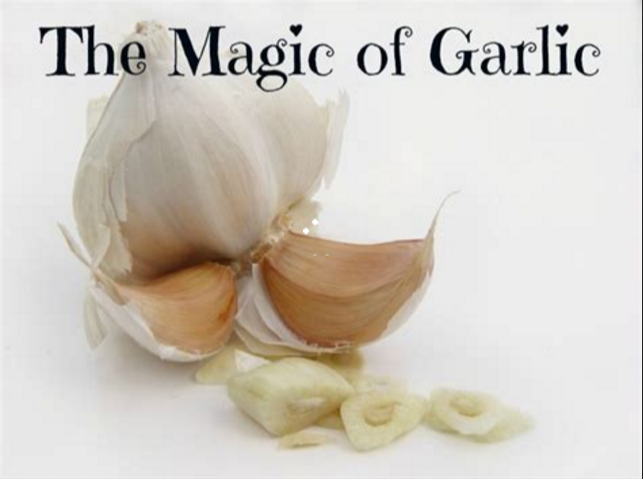 Besides sulfure compounds garlic contains 17 amino acids and their glycosides, arginine and others. Minerals such as selenium and enzymes like allinase, peroxidases, myrosinase, and others. Garlic contains a higher concentration of sulfur compounds than any other Allium species. The sulfur compounds are responsible both for garlic’s pungent odor and many of its medicinal effects. The odor is formed by the action of the enzyme allinase on the sulfur compound alliin. This enzyme is inactivated by heat, which accounts for the fact that cooked garlic produces neither as strong an odor as raw garlic nor nearly as powerful physiological effects. However one of the most biologically active compounds, allicin (diallyl thiousulfinate or diallyl disulfide) does not exist in garlic until it is crushed or cut; injury to the garlic bulb activates the enzyme allinase, which metabolizes alliin to allicin. In addition allicin is further metabolized to vinyldithiines. This breakdown occurs within hours at room temperature and within minutes during cooking. Allilcin, which was first chemically isolated in the 1940’s, has antimicorobial effects against many viruses, bacteria, fungi and parasites. Like allicin, ajoene, is another chemical constituent thought to be most important to health. Ajoene is a garlic-derived compound produced most efficiently from pure allicin and has the advantage of a greater chemical stability than allicin. Several clinical trials and in vitro studies of ajoene have demonstrated its best-known anti-thrombosis, anti-microbial and cholesterol lowering activities. Recently, topic application of ajoene has produced significant clinical response in patients with skin basal cell carcinoma. Ajoene was shown to inhibit proliferation and induce apoptosis of several human leukaemia CD34-negative cells including HL-60, U937, HEL and OCIM-1. Besides it’s anti-thrombosis, anti-microbial and cholesterol lowering activities, ajoenes and dithiins are among the most active compounds formed from fresh garlic. Ajoenes have been shown to: possess antithrombotic (anticlotting) activity in human platelet suspensions; possess antitumor activity; display significant antifungal activity, inhibiting the growth of Aspergillus niger , Candida albicans , Paracoccidioides-Brasiliensis , and Fusarium species; inactivate human gastric lipase, a sulfhydryl enzyme involved in the digestion and adsorption of dietary fats; function as antioxidants by inhibiting the interactions of leukocytes which mediate release of superoxide anion. George Barany, chemist at the University of Minnesota, reports that ajoene is as potent as aspirin in preventing sticky red blood platelets from clumping together. Related factors lengthen clotting time, while others actually dissolve clots. All three effects can impact on heart attack and stroke prevention. Besides George Barany, National Cancer Institute nutritionist Elaine Lanza states "There is still a big interest in the area of fat and fiber, but right now, there is more emphasis on the idea of trace compounds, non-nutrients in vegetables and fruits that work against tumor formation." "Garlic tops the list as a source of these trace elements or micronutrients." The two major compounds in aged garlic, S-allylcysteine and S-allylmercapto-L-cysteine, had the highest radical scavenging activity. In addition, some organosulfur compounds derived from garlic, including S-allylcysteine, have been found to retard the growth of chemically induced and transplantable tumors.